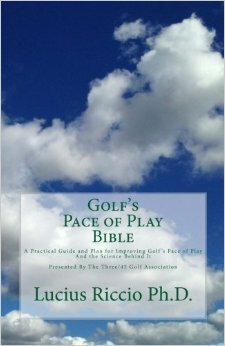 The Three/45 Golf Association, a non-profit of golfers, course owners, manufacturers, and architects advocating quicker play, has just released its first advanced study of pace of play, perhaps the most comprehensive report ever. Rather than relying on surveys like past studies, the researchers utilized GPS-equipped carts to collect precise information on more than 40,000 rounds last June at 175 public and private courses. This book is designed to provide a blueprint, a road map, a plan to improve the pace of play in America. It does that by taking advantage of a wide range of scientific studies, data collection efforts and real-world experiences. It recognizes the complexity of the problem but also points out practical, simple-to-understand principles which, when applied, can make a big difference in how long it takes to play the game and increase the enjoyment of all golfers. A version of this article appeared in print on June 12, 2013, on page B13 of the New York edition of The New York Times with the headline: Using Humor to Get a Little Respect for Faster Play. ARDMORE, Pa. — For years, golf has struggled with its image as a fuddy-duddy sport for the elite that is, above all things, very, very slow. But now, the United States Golf Association, the most serious-minded group in an often humorless golf community, has decided to embrace the game’s most comic and caustic critic, the very one whose satire helped create the stereotypes that once made the golf establishment bristle. In an attempt to shake golf out of its slow-playing doldrums, those who help run golf will unveil a new campaign Wednesday celebrating “Caddyshack,” the raucous 1980 movie headlined by the working-class comedianRodney Dangerfield that lampooned golf’s stuffy country club reputation. More than four million golfers have given up golf in recent years, and the primary culprit, researchers say, is the tedious pace of play. Desperate for a solution, golf’s leaders, on the eve of this week’s national championship, have turned to “Caddyshack,” resurrecting one of Dangerfield’s zingers in the film and making it the linchpin for a campaign aimed at rescuing the game. The centerpiece of the videos and the faster-play movement is the line Dangerfield’s movie character shouts as he watches his antagonist, Judge Smails, fidget, twitch and delay as he prepares to hit a tee shot. Palmer says the same thing as Eastwood overthinks a shot standing along the ocean, drawing one of Eastwood’s best Dirty Harry-like stares. Sorenstam and Creamer are seen laboring over how to best deliver Dangerfield’s renowned line, an impersonation that includes tugging on an imaginary tie, Dangerfield style. But the long-term consequences for the golf industry are serious. According to polling done by the National Golf Foundation, more than 70 percent of golfers believe pace of play has worsened lately and half have admitted to walking off the course in frustration during a marathon round. The U.S.G.A. is not alone in its attempts to get people to move along more quickly. A nonprofit group called the Three/45 Golf Association — so named for how long a swift round should take (as opposed to the five hours it can now take) — has gathered golf course owners, golf architects, manufacturers and golfers to develop a pace-of-play manifesto. Last month, Golf Digest magazine joined with the P.G.A. of America and the U.S.G.A. for its “Time for Nine” campaign, which encourages golfers to consider playing only nine holes because it might be more suited to modern, overcrowded schedules. Lucius Riccio, a Columbia University business and engineering professor who also teaches a class in sports analytics, founded the Three/45 Association and has used scientific methods to analyze the causes of slow play. “It’s a very complex issue — more involved than people think — but it’s got to be solved at the grass roots,” said Riccio, who conceded that he had recently walked off a course when he grew tired of waiting. The U.S.G.A. videos, which are more like public service announcements, come less a month after the organization took a widely debated stand against the use of anchored putting strokes. Both moves appear to be part of a strategic transformation for the U.S.G.A., a 118-year-old organization that has been criticized in the past for its distant, or arbitrary, governance. Composing comic videos aimed at tackling an industry problem, and doing it with the help of some of the game’s biggest names is a bold step. The videos are meant to be the jumping off point in a”While We’re Young”campaign, as each skit directs people to a newly created Web site that asks golfers and golf facility managers to sign a pledge to improve pace of play. Completing that step leads to a pace of play education program and a resource center on best practices for golf courses to address hole length and routing, green speeds and the height of rough — all pivotal factors influencing the pace of play. As much as the videos released Wednesday focus on the role of the player in the slow play issue, the U.S.G.A.’s research has revealed that other parts of the golf experience outside the players’ control contribute greatly. Most significant might be the intervals that golf course managers send groups off the first tee. Hoping to maximize revenue, it is not unusual for courses to cram the course with golfers, sending them off every eight minutes. But as Jerris pointed out, the initial par 3 on a course is the usual telltale bottleneck spot, bringing everyone to a temporary halt as groups take on average 12 to 13 minutes to play the hole. Research has shown that if golf courses sent golfers off the first tee at an interval equal to how long it takes to play the first par-3 hole, then flow around the golf course would be more smooth. That might keep more golfers happily coming back to the course, which would have long-term economic benefit. But can golf’s leaders sell that concept to the public? Perhaps with the help of Dangerfield, who died in 2004, but whose “Caddyshack” lines live on. Host/Producer Danielle Tucker interviewed Dr Lou Riccio on her show “The Golf Club Radio Show” on July 27, 2013. On her show, she invites Hawaii’s Golf Pros and across America sports shrinks, authors, mental coaches and PGA broadcasters. Below is a recording of the same in case you missed it or want to listen again. Russell Evans, host of “Golf Exchange presented by the Honda Classic,” had the founder of the Three/45 Golf Association, Lucius Riccio, on his show. They primarily discussed pace of play. Click here to download this interview. Golf Channel has made June their Pace of Play Month. To kick off the month, they have invited the founder of the Three/45 Golf Association, Lucius Riccio, to be in their studios for the Morning Drive Shows on both Saturday June 1 and Sunday June 2. Tune in both days before heading out to the golf course. He will also return at the end of June to make predictions about future pace of play efforts. 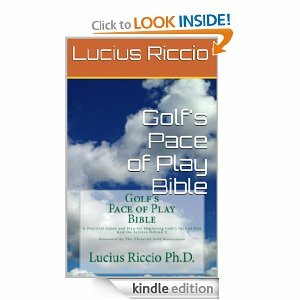 They have asked Riccio to lead their full month’s campaign and to follow up at the end of the month because they recognize his research has had the greatest impact on our understanding of the causes of slow play and that the Three/45 Golf Association Principles and objectives are what the game needs right now. Spread the word about our Association and get all your fellow competitors to join. We can only make progress if we all join together. Part 1: Dr. Lou Riccio discusses solutions to slow play in this first of two-parts on ‘Morning Drive’ on June 1, 2013 at 7AM ET. Part 2: Dr. Lou Riccio discusses solutions to slow play in this second of two-parts on ‘Morning Drive’ on June 2, 2013 at 7AM ET.